It’s no secret that we’re huge fans of Ash vs Evil Dead here at io9. It’s one of the funniest, goriest shows ever to grace the airwaves, and after all, it’s based on one of the greatest horror trilogies of all time. With season two kicking off this weekend, we’ve been thinking about what we’d like to see in the new episodes. Ash’s evil twin—a callback to Evil Dead II and Army of Darkness—popped up in season one when he regenerated himself from Ash’s severed hand. There’s a hint of some sinister shadowplay in the season two premiere, which hopefully means good old Bad Ash will be returning once again to torment his mirror image. Bruce Campbell may be a little less rubbery than he used to be, but he’s still a wonderfully gifted physical actor, and seeing him fight himself is one of the Evil Dead series’ greatest pleasures. I read somebody’s online thing, ‘Oh look, they’re only pulling from these two [Evil Dead] movies.’ This season, we do bring up Ash’s events in Army of Darkness, and reference it. It was more that there wasn’t a place for it in our storytelling that we needed to talk about that. If he started blabbing to these shop clerks about, ‘Yeah, I went back to the Middle Ages and did all these things,’ [it would just be exposition]. But that is in his memory bank, and he’s going to pull it out at the appropriate time. References are one thing, and we’ll be thrilled to hear Ash reminisce about fighting Deadites in the year 1300. But why not go one step further and introduce time travel into Ash vs Evil Dead? We know, thanks to the films, that the Necronomicon is capable of opening portals into different eras. Why not zap Ash, Kelly, Pablo, and whoever else forward or back in time? Or even better, combine time-travel with Bad Ash’s next appearance, and have a parallel-dimension Ash suddenly appear in Elk Grove? Ash vs Evil Dead scored a major casting coup by getting the Six Million Dollar Man to play Ash’s father. Already, you know that Brock Williams is not to be fucked with. He and Ash don’t get along—for one thing, Brock doesn’t believe Ash’s rampage in the cabin 30 years ago was due to anything supernatural. But these two are too much alike not to eventually join forces, and Ash is going to need all the help he can get to save the world. Dad’s already got the blue shirt and the shotgun; the next logical step is reconciling with Ash and joining the fight. At Comic-Con, Majors talked about getting doused with gallons of stage blood—a rite of passage for all actors on Ash vs Evil Dead, and one we hope happens as a result of Brock mowing down legions of Deadites. When Ash, Pablo, and Kelly roll into Elk Grove, Ash says his parents died a long time ago. But just moments later, we meet Brock. So might Ash’s mother still be kicking around out there somewhere? If Ash vs Evil Dead is going to introduce her, there’d be no better opportunity than while Ash is back in his hometown, grappling with the ghosts of his past, including his surly father and his dead-since-Evil-Dead sister, Cheryl. And come on: aren’t you curious about the woman that gave birth to Ashley J. Williams? We know Ruby’s last name is Knowby, which ties her to characters in the first two Evil Dead films. We know she’s mostly immortal—unless the Kandarian dagger is around. We know the Deadites are well aware of her existence and even refer to her as “traitor.” And we know she wrote the Necronomicon, though she’s not always capable of controlling its powers. Those are a lot of weird facts for one character, especially with no solid origin story to back them up. This season, Lucy Lawless will have a much bigger part in the show, so there will be way more room to dig into Ruby’s history. The big bad this season, a demon named Bael, has been described as someone who was once “intimately connected” to Ruby, so it seems likely we’ll be getting some answers about where (and when) she came from. Submitted for your consideration: Ted Raimi played Evil Dead II’s kindly-old-lady-turned-possessed-cellar-dweller Henrietta. Ted Raimi is on this season of Ash vs Evil Dead, playing Ash’s suitably weird childhood best friend. Might not Ted Raimi also be coaxed into Henrietta drag one more time, to have another crack at swallowing Ash’s soul? Before Ash vs Evil Dead, when we were all still hoping that Evil Dead 4 might happen, the Army of Darkness comics sent the post-movie Ash on a series of wild adventures including into some crossovers with other horror films. It might be too much to ask that Freddy vs Jason vs Ash ever transpires in live-action, due to rights issues and all that, but we’re dreaming big here—and even just a reference to any events depicted in the comic books would be very fun. But there was also an Ash cameo at the very end of the 2013 Evil Dead remake. 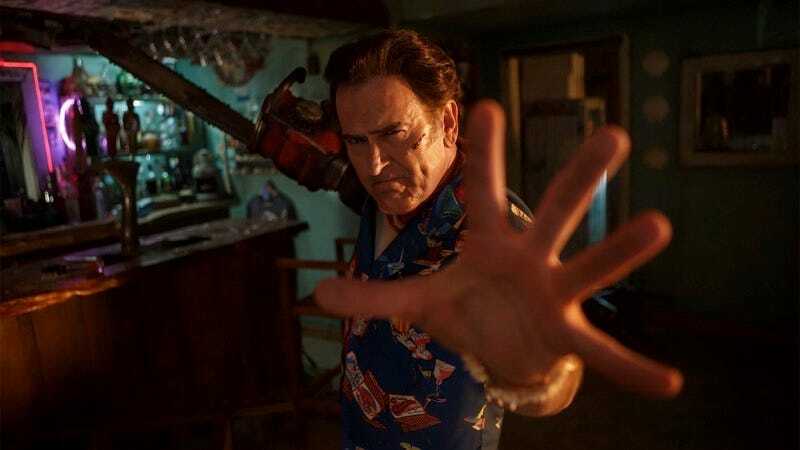 An appearance by that film’s hero, Mia, might be too disruptive for Ash vs Evil Dead’s continuity, not to mention its very Ash-centric focus, though there have been previous discussions of merging the Ash and Mia storylines. Still, a cameo from Jane Levy, even if she doesn’t appear as Mia, could be delightfully sly. Ash vs Evil Dead returns to Starz on October 2.